On a not-so-quiet street in a peaceful town, there’s a row of shops facing the imposing stone structure of the county courthouse and the green expanse of the courthouse square. 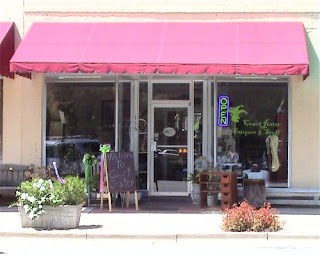 Nestled in amongst these shops, situated between a florist and a lawyer’s office (or a realtor’s office, or both – there are signs for both, anyway) is this charming shop called The Court Jester Antiques and Stuff. Owned by Judy Bruce, The Court Jester’s name says it all. The antiques that Judy sells are eclectic, nice pieces that strike a happy medium between old, rusted out junk (not gonna find anything like that here!) and Louis XIV end tables (won’t find anything like that, either). Not being an antique fanatic, it’s hard for me to describe them, but I can say that, scattered around and in front of her shop, the antiques she carries lend a cohesion and charm to her displays. Then there’s the “& Stuff” part of her shop. Again, the selection is eclectic and well chosen with an emphasis on crafts. Many of the crafts are by local artisans, including yours truly. There is hand-crafted glass bead jewelry in bold, vibrant colors and designs; a plethora of nose-tantalizing candles; glass works and; of course, the finest soaps with which you could ever want to bathe. Sometimes, Judy’s sharp eyes and appreciation for quality may snag on incredible yard sale finds. Back in July, she had two charming, handmade four-poster doll beds that she’d found at a yard sale and that, of course, my older daughter just HAD to have. Unfortunately, they both got sold before we had a chance to purchase them; one was going to be a treat for her that weekend. This is just a taste of what you can find at The Court Jester. As you enter the shop, your first impression might be, “Wow, this is small!” Yes, the front room is small, but that’s just the beginning. The front room is like the antechamber to an amazing cavern of treasures waiting to be discovered. The shop is deep, with goody-filled halls leading from room to room, each one highlighting particular wares. My first experience of the shop was delight as Judy led my older daughter and me throughout each room. And while some products are constant – soaps, candles, jewelry and books, to name a few – I’d guess at least half of the inventory rotates, with new wares coming in as Judy finds them at estate sales and auctions. 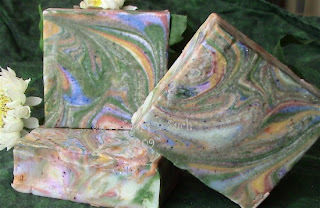 In July, I posted about the two new soaps I had on the rack, Beach and Patchouli. They’ve finished curing and are ready for purchase. Since I’ve been spending the past month getting re-used to having a baby in the house, I haven’t really done more with these soaps than stand and admire them, picking them up to sniff them and show them off to visitors. These soaps have enjoyed a longer cure time, resulting in even milder, harder bars than the high quality soaps I usually make. And they’re still curing! I’m leaving them on the rack until the very last minute. This is the Patchouli soap in all its psychedelic glory. This soap features my most ambitious swirl attempt ever – seven colors. If you’ll pardon a bit of vanity, I’m really proud of these. Not only are these a visual and olfactory treat as dry bars, but using them increases the pleasure. Patchouli’s warm, earthy, spicy, sensual scent wraps itself around you, and each use of the soap reveals a new and different swirl as each layer of color fades away. These soaps are moving fast; I’ve already sold all but two soaps from this batch. Click here to order yours today. Posted on September 3, 2009 Categories Vintage Sara's Soaps 'n SuchLeave a comment on They’re Finally Ready! I am pleased and delighted to announce the birth of my beautiful baby girl!!! Hannah Ilyssa was born Friday, 31 July at 3:46 p.m. She weighed 7 lbs., 11 ozs. and was 19.5″ long. And did I mention she’s beautiful? Her daddy, big sister and I are all thrilled with her. She’s a good baby [I hate that expression, like there’s such a thing as a “bad” baby?] and is beautiful, just like her big sis is. There was a bit of an adjustment at first, but we’re settled into a routine now. Mary, our oldest, has been a tremendous help. In fact, her major trauma of the week was not being allowed to change or feed Hannah while Mary got over a little case of the sniffles. When we gave her the “all clear,” she beamed. Even dirty diapers are no match for a devoted, loving, helpful older sister. I discovered several things along this birth and recovery journey. I’ll spare you the birth story; I don’t feel this is an appropriate forum for that. Among everything else, though, I learned that you only get 6 weeks of maternity leave when someone else is the boss. Being the owner of my own business hasn’t left me a lot of time for just sitting with my feet up. If I time it right, however, I have pockets of time throughout the day which are perfectly designed for getting business stuff done. Another aspect of new motherhood is bone-deep fatigue. Given that, I’m going to stop talking and bid you “g’night, dear readers.” In future blog entries, I have exciting news to share with you about the beer soap I’ve been making, my first wholesale account (woot! ), Peter’s first start-to-finish soap and whatever other great topics come to mind.